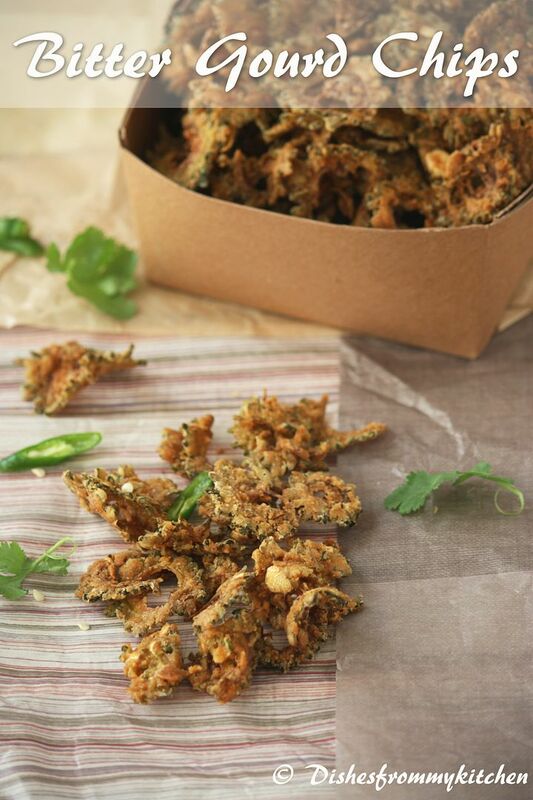 Dishesfrommykitchen: BITTER GOURD CHIPS - ADYAR ANANDA BHAVAN STYLE !!! BITTER GOURD CHIPS - ADYAR ANANDA BHAVAN STYLE !!! Warning: Beware Bitter gourd hater’s you will start loving this chips. 1. Wash and dry the bitter gourd. 2. Slice the bitter gourd using the slicer, this is important to make the chips nice and crispy. 3. The slices should be neither thick nor thin. 4. Mix cornflour, rice flour, chickpea flour(besan) and all other spice powders with salt in a bowl, reserving 1/4 cup cornflour for later dusting. 6. Make sure the spice mixture is nicely coated. Keep this mixture aside. 7. When you are ready for frying, heat oil in the pan. 9. Check the temperature of oil, fry the bitter gourd in hot oil in batches until the big bubbles ceases (until the shh.. sound subsides). 10. Drain them in the kitchen towel. 11. Once you are done with all the bitter gourds, bake them in the oven (spreading out in the tray) for 10 minutes in 350 F preheated oven. 12. Cool and store in airtight container. 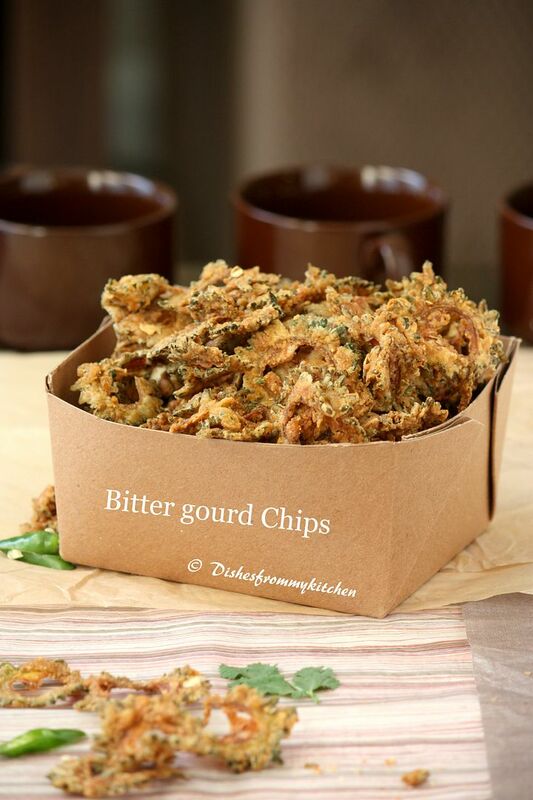 Bitter gourd chips is now ready for Munching!!! 1. The bitter gourd should be evenly sliced. 2. 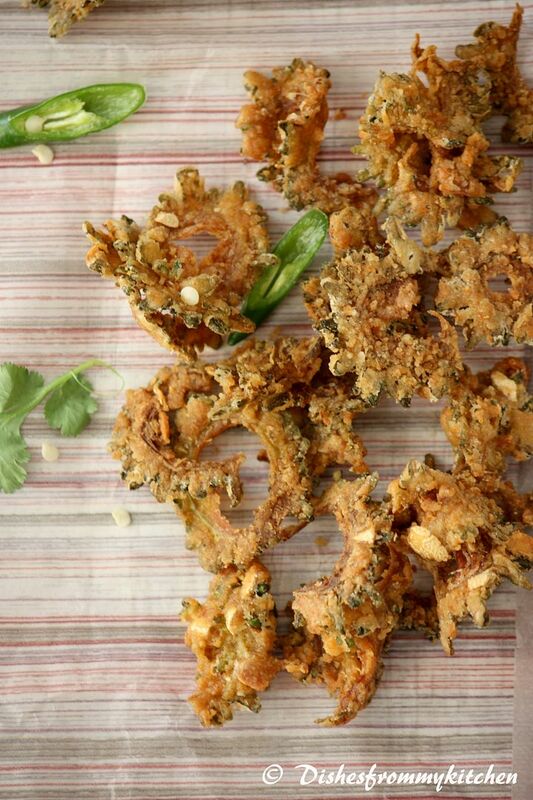 Baking them after frying makes the bitter gourd chips crispier and also it can be stored well. 3. 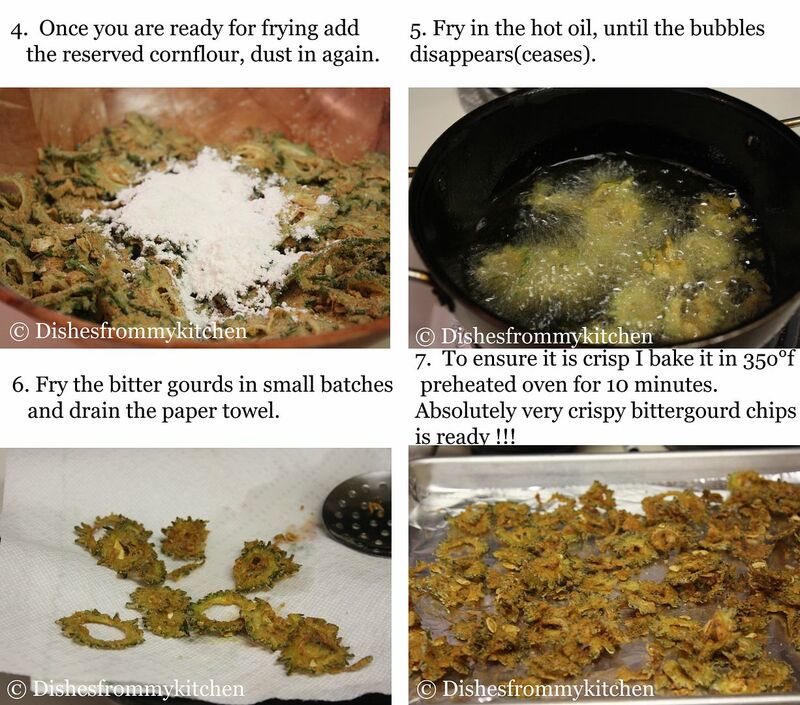 While Frying, fry until the bubbles ceases(Shh sound subsides) this is very important to get crispy bitter gourds. 4. 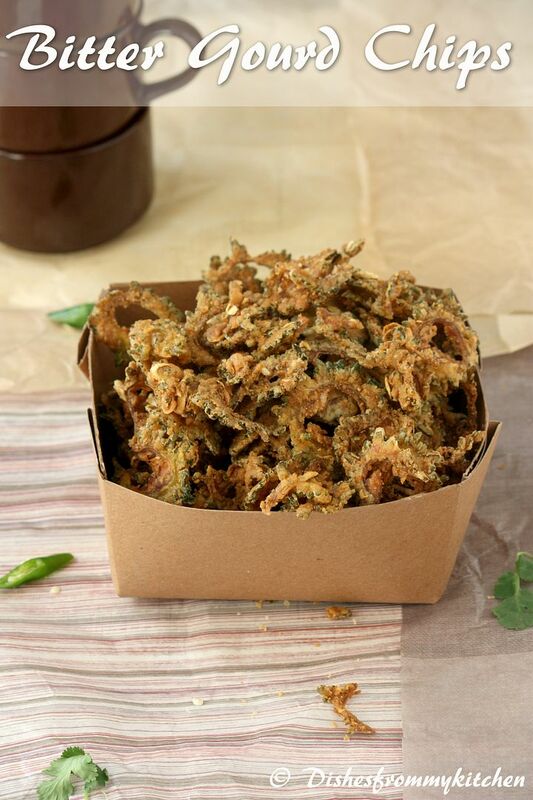 You can also bake this bitter gourd chips in the oven instead of deep frying. If you are baking in the oven then 1/4 cup corn flour which we are using later for dusting is not needed. Just add 3 tbsp of oil in the bitter gourd mixture then bake them in the 400 f preheated oven for 25 to 30 minutes until they are nice and crisp. 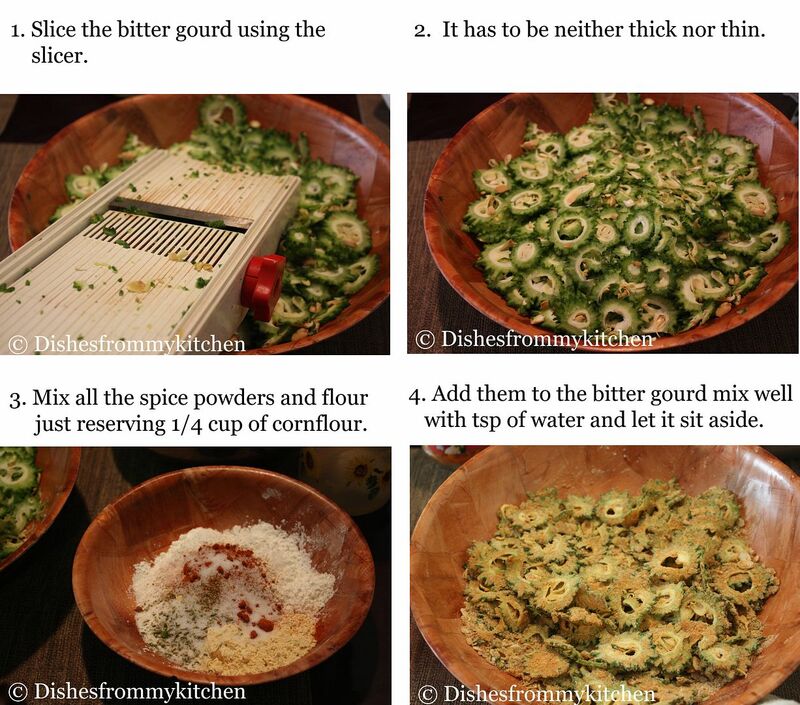 Rotate the tray for every 10 minutes and also flip the bitter gourd for every 15 minutes. Crispy and perfect, I love this too! Tempts me for a bitter gourd disliker. this is prob the only karela dish that i eat..i love it. such a nice recipe, crispy and delicious chips. Yes, they are so delicious crisp and well balanced in taste at the said outlets. You have recreated that beautifully. I love bitter gourd and the chips look crispy and delicious! Never had these........looks really tempting . 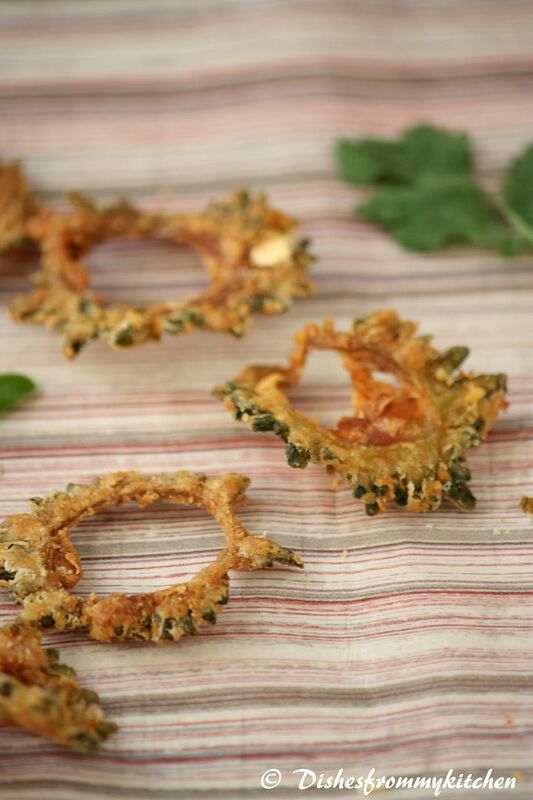 Crispy and delicious snack with butter gourd pavi. Iam one among the bitter gourd haters :) got to try it sometime. Haven't tried in Adyar Anandha Bhavan yet, the one you have made looks awesome. Delicious chips, perfectly done. Awesome cicks. They are so crunchy and tasty. I would probably end up finishing the whole dish and want MORE! Love it. I will now stop buying these from hot chips. and make them at home. Thanks. I made a slightly different version from Rak's kitchen. And yes they were delicious. This is nice!crispy and yummy. Beautiful........Nice & crispy..........hubby will love this. 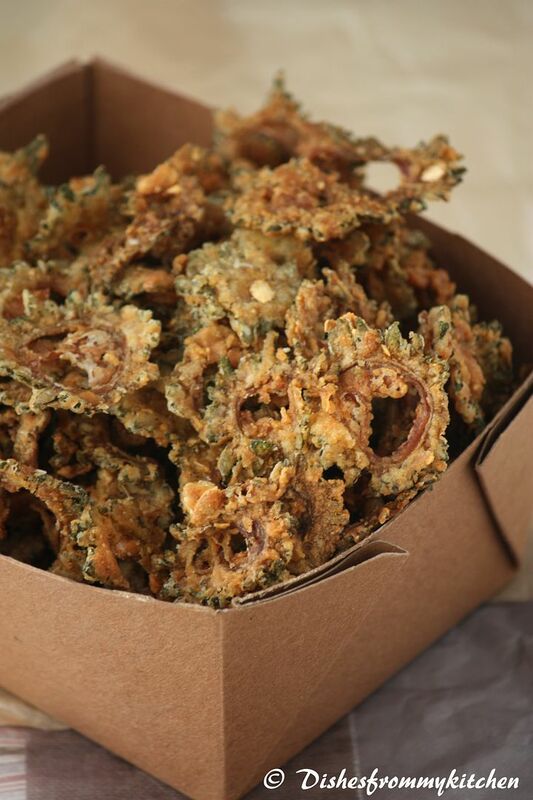 love the crispy chips, looks perfect. Thanks for visiting my blog through Flavor Fiesta. :-) In Japan people in Okinawa eat a lot of bitter gourd and it's very famous to grow the vegetable there while the rest of Japan don't really eat this. I love that you deep fried them. Must be so delicious! I love those chips too and I bake them at home. Gorgeous clicks.